"Philip Linton, whose testimony had helped convict nineteen murderers, died in the belief that the mute testimony on the floor beside him would help convict a twentieth. He was a good cop to the very end." 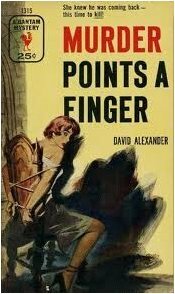 - David Alexander's Murder Points a Finger, 1953. The name Ellery Queen has always been synonymous with The Dying Message, permanent associates like John Dickson Carr and The Locked Room Mystery and Agatha Christie and The Closed Circle of Suspects, but this liaison never produced a work that became the flagship for that particular brand of detective fiction – unlike The Hollow Man (1935) and The Murder on the Orient Express (1934). You could argue on behalf of The Tragedy of X (1932), introducing the Queenian motif of the dying message, but the moribund clue didn't turn up until the final quarter of the book and it's not one that has aged well. Its interpretation relies on a nugget of trivial, everyday knowledge that the passage of time relegated to the dustbin of history and not something contemporary readers should be expected to know. So Ellery Queen's close association with The Dying Message seems to have more to do with their prolific output than that one of their stories became a textbook example of the form. This is not a putdown of Ellery Queen, but after I had finished reading David Alexander's Murder Points a Finger (1953) I was seized by the realization that it was, perhaps, the first detective novel I read that was as exemplary for The Dying Message as Dashiell Hammett's The Maltese Falcon (1930) was for The Private Eye and Isaac Asimov's The Caves of Steel (1954) for The Hybrid Mystery. Murder Points a Finger sets about when the hour-glass of a former police lieutenant, Philip Linton, only has a few grains of sand left in it and murder is accompanying him on the way home. Linton was a much-lauded expert on fingerprints and had spend the bulk of his years on the force in the identification department, where his expertise on the esoteric patterns of whorls, arches and loops helped secure convictions for nineteen murderers – and his cryptic dying message may put away another one. Philip Linton's friend, Dabney Ashton, is a distinguished theatrical performer with one or two television parts to his credit, an accomplished chess player and a ex-special agent who decoded enemy messages during The Great War, but this does not make him the perceptive debonair amateur sleuth – who picks up on all the subtle hints that the police missed. On the contrary, he's quite inept when it comes to police work, despite his knack for puzzles, and a burden on the investigating officers. Ashton is unable to correctly translate his friends dying clue, which, almost immediately, results in the police going for the simplest answer and swear out an arrest warrant against Linton's foster son, Abner Ellison. Meanwhile, everyone is on the lookout for Linton's granddaughter, Pat, who was kidnapped after she went out to dinner with her fiancé, policeman Allan Walters, on the night of her grandfathers murder and Ashton's meddling could very well have been the driving motive behind a second murder. Needless to say, as the investigation drags on without the desired results, Ashton begins to feel that he has let everyone around him down and this provides the story with a realistic view on the infallible storybook detective, but, at the same time, it also fully embraces some of the more bizarre features that can be found in the works of members from the Van Dine-Queen School. In the background of the story, the sentry towers and battlements of Mad Hatters Castle, erected by an Albanian who amassed a fortune with cheap, knock-off hats that were copied from more expensive models, casts dark shadows over the events and inspiration for the solution is found in an old speakeasy, "Gypsy's Cosmic Tea Room," that went on after the prohibition era ended – and provides a dwelling for some of the cities most eccentric drinkers. This makes the story read, at times, like one of those half-conscious, lucid dreams in which imagination and reality merge together effortlessly and this partly prompted me into placing an order for another one of his books. But more on that when it arrives here in a few weeks time. The solution is not a disappointing one, however, it won't kick you in the teeth and leave you stupefied, either, as any seasoned reader of detective stories will probably catch up with the murderer before arriving at the halfway mark of the book – even if you fail, like yours truly, to decipher the clever, but ultimately, simple dying message. But the predictability of the murderers identity does very little damage to the overall quality of the story, at least, there were not any serious scratches on the reading pleasure that I derived from this book. On a whole, a very satisfying, if a somewhat unusual, detective story that ranks alongside Theodore Roscoe's Murder on the Way! (1935) and Pat McGerr's The Seven Deadly Sisters (1948) as the best mysteries I have read this month – and with that we've come full-circle! The three best detectives I devoured in the first month of this year are all exemplary stories for The Locked Room Mystery, Closed Circle of Suspects and The Dying Message as well as representing three succeeding decades. This is a favorite of mine, and one whose lack of reputation always surprised me. 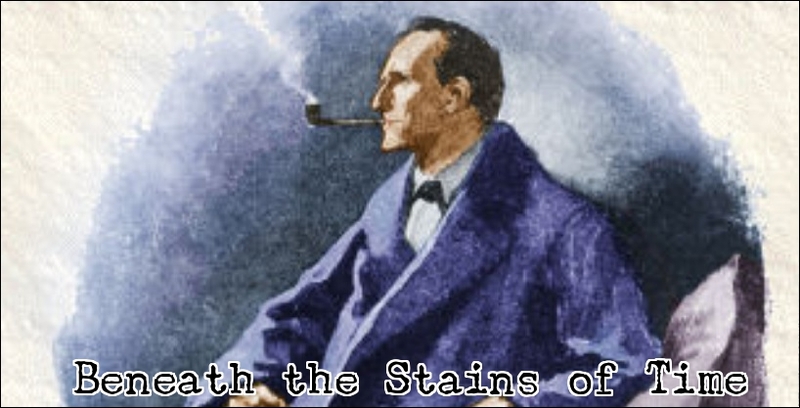 It is all the more notable as its author was not usually associated with the traditional mystery genre. Dying message stories work for me the best when they are in the short story form, also with Queen's works. Combined with other tropes, dying messages might work well in a longer story, but there are limits to how long a discussion about the interpretation of a message can be, IMHO. Wow - now that's ingenuity. Alexander was recently featured on Mystery*File where in passing it is mentioned that one of his series characters is a "penguin fancier" prompting me to track down one of those books. I am a sucker for the weird in any book, especially mystery novels. Luckily, there is a shelf full of David Alexander books at my local branch of the library so I'll be spared having to dish out more money to satisfy my curiosity. Now I'll be adding this one to the pile. This is indeed a book that should be better known, if only for its excellent treatment of the dying message. Well, you are probably correct that the short story form is better fitted for the dying message, but even then I can't think of a story that is exemplary of this trope and I don't believe it has to be the constant subject of discussion in order to be successful in a full-length novel – which Alexander demonstrated with this book. It's not the main focus of the investigation nor is it shooed away until the final chapter and a large portion of the plot was propelled into motion due to its incorrect interpretation. He took full advantage of the possibilities that the dying clue offers. So it can be done. Now that you mention it, I think every anime/manga mystery (and Conan in particular) that I have read or watched had dying messages and the most memorable one was the one with the blank puzzle pieces from DAQ. It's as impossible as it's unbelievable, but nonetheless very original. Oh, and the Columbo episode Try and Catch Me also had a clever little hidden dying message, but then again, the entire episode is just a joy to watch. The Devotion of Suspect X will be up very, very soon! The discussions on MF is what prompted me into moving this book to the top of the heap and if you are a sucker for the weird, than you will probably feel at home at "Gypsy's Cosmic Tea Room." Hopefully, your library won't provide you with an opportunity to beat me to the David Alexander novel I ordered, which won't arrive for, at least, three or four weeks. See how I totally ignored the new branching system for answering comments? I do it old school. I've a had a few of this guy's books kicking around unread for the past twenty years or so. Die, Little Goose and Terror on Broadway come to mind. Time to dig 'em out. David Alexander is one of my favorites. As a former newspaperman myself, I have a special fondness for his Bart Hardin stories built around a New York editor and columnist. Alexander based the background of Hardin on his own life. He was an editor and columnist for the New York Morning for a decade. What I didn't learn until a few years ago is that Kentucky-born Alexander was one of the leading journalists covering thoroughbred racing as racing editor for the New York Herald Tribune and columnist for important racing publications Blood-Horse and Thoroughbred Record. He wrote one of the best histories of the sport A SOUND OF HORSES (Bobbs-Merrill 1966). I was tipped to this when reading Laura Hillenbrand's wonderful bestseller SEABISCUIT (2001). Throughout her book she quotes David Alexander who was a witness of many of the events and also a good friend of the jockey Red Pollard. Alexander kept in touch with Pollard long after he left the public spotlight and it is his reporting that fills in that part of the story. I confirmed with Hillenbrand that the Alexander she quotes is the same as the mystery novelist and later ordered and enjoyed his fine history of the sport. Thanks for this chunk of background information on David Alexander! He's a new name to me in this field, but want to read more of his stories this year and additional information, like this, is always welcome. His novels are well worth searching out as are his short stories--there was a collection in 1961 HANGMAN'S DOZEN. Bill Pronzini, while appreciating Alexander's novels, believed he was even a better short story writer. I see my last post left out the final word in a newspaper title. Alexander spent ten years as managing editor and columnist for the "New York Morning Telegraph". This was a morning tabloid with a following among "the sporting crowd" and was clearly the basis for Bart Hardin's "Broadway Times". Well, a recommendation from Pronzini is enough for a book to secure a top spot on my wish list, but, for now, I will be awaiting the arrival of The Death of Humpty Dumpty - which also procured a spot in Adey's Locked Room Murders and will be introducing me to the Bert Hardin character. Hopefully, it's a good one to start with.